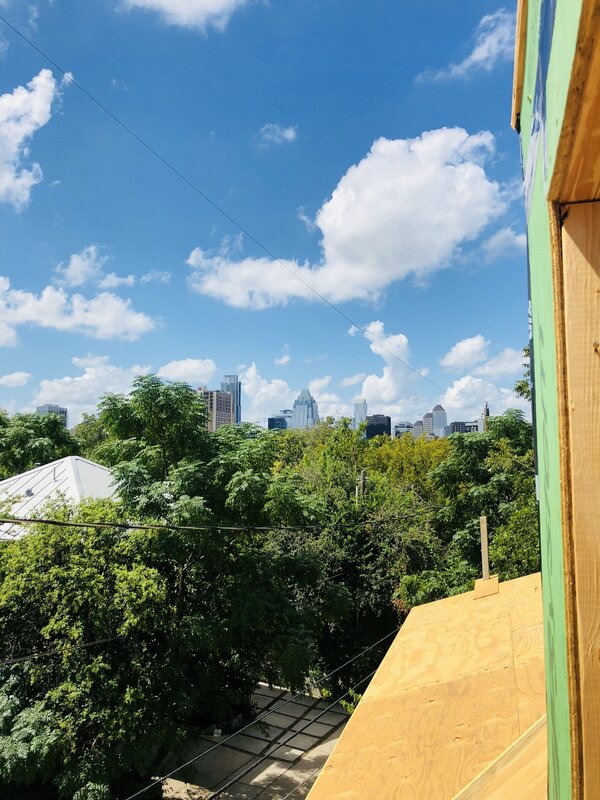 From Austin's best inside tips to design trends and market updates, the Stone & Acre Blog keeps you up to date on Central Austin living. We are always working to exceed your expectations. Whether you're ready to buy or sell your home, or simply exploring your Austin - our team is here to help you make your most strategic real estate investment. As I think about wrapping up 2018, I’d like to take a moment to give some thanks. This has been a challenging year full of growth for me. Not all growth is easy, but it feels so good to work through it and come out the other side stronger than ever before. I’m thankful for my family and friends – I had genetic testing done a while back and my doctor laughed and told me I had Viking blood, which would explain my stubbornness and determination. I’m so grateful that I come from strong stock. My family never gives up and they support me in all my endeavors. My parents have been married 44 years this January and through thick and thin they have remained loyal to each other and their children. Life is hard and this example of dedication and devotion leaves little room for selfishness. My parents have shown me that life is all give and take, peaks and valleys and love is about putting another first if you want to make headway. My friends and family remind me of all the ways I shine and see the good in me. When I’m feeling insecure they remind me of my strength. In life is all you need are a few good friends. Connection is what makes my life complete and it’s the best feeling in the world to know you are loved. I’m thankful for my two boys – I’m grateful for my boys who are growing up faster than I’d like. As a single parent who works full time and splits time with them between two households, I often worry that some great life lesson is going to slip through the cracks. It’s hard to discipline your kids and know that when they go to the other parent’s house you have no idea what they are doing. As a single mom, I’ve had to let go of so many things. Sometimes the only thing I feel like I can control raising tweens/teens is being honest with them. I try to talk to them about EVERYTHING, show them what it means to be a good human through my actions, and do my best every day to be happy in my own life. I’ve had to give them a long rope and trust they’ll make good choices. It’s hard to let go of your children but just like any human, can you really control who they become? No, you can guide them, talk to them and let go. By letting them make their own decisions and being a good example to them, I hope they will rise to the occasion. Sometimes a little freedom is all we need to fuel passion and creativity to find our place in the world. I’m thankful for the constant practice in trust and letting go. I love my boys and I’m thankful they keep it real for me. I’m thankful for my career – I’ve been in the real estate business about 15 years and I have learned so much about life from working 100% commission. I’ve developed thick skin and a stomach for uncertainty. I’ve learned to plan ahead and save for a rainy day. I’ve learned to trust the process and stay accountable. Not knowing where your next paycheck is coming from makes you hustle and stay present. It’s the most rewarding job and the toughest. There’s never time to let up and to be a better you have to make a plan and work it. You also have to manage personalities if you want to have a successful transaction and a happy client. This is not always easy but it has translated into a pretty handy tool for life. Between my teenagers and my relationships, it’s a constant negotiation and practice of listening to meet needs. Who would have ever thought real estate was going to tee me up for life. I’m thankful for Compass – I joined Compass mid-November after building and branding my own company the past two years. It was an opportunity that presented itself out of the blue, and I made the decision to leave my own brand to join this team. It was like the universe served up everything I was missing on a silver platter. I’m so grateful to be working for such a smart, savvy, agent focused tech company that is working hard to change the experience for real estate agents and the client. Getting in on the ground floor of the Austin, TX launch and working with the best in the business has caused me to pinch myself more than a few times. I can’t wait to see what the future holds for me and my clients. I’m thankful for my team - When you are financially supporting other people based on your performance it can feel like a lot of pressure. Will I be able to afford my assistants? Can I bring in enough work to sustain everyone? Will there be enough new business in the coming year? I don’t have a crystal ball, but if there’s one thing I know, I have to show up every day and do the best job possible with each client. My entire life I’ve had to trust that my needs will be met, and you know what? They always have been. I was talking to my mom a few weeks ago stressing about the uncertainty in the economy and she reminded me that my needs are being met. It has helped to change my focus from my own wants/needs to that of my team as a whole. We are working together towards a common goal. I couldn’t do what I’m doing without my team. The shift happens when you see your business as machine that fuels many people. Open your outlook and think about how everyone benefits from working together to achieve goals. Jim Rohn always said that you get paid by bringing value to the marketplace. Work together to grease that machine, trust in the process, know that there is enough for everyone and you will reap the rewards. When you work to sustain others, the universe will beat down your door to make sure you have everything you need and more! I’m thankful for my independence – My mom taught me from an early age never to be dependent on another person to support me. I’ve always been a risk taker and I’ve made choices in life to insure my financial freedom. I’ve gone through a lot and because of my ability to provide for myself and my children, I’ve had options. I’m grateful that I am free to make decisions from a place of power. I’m thankful for Pilates – I started doing Pilates a year ago and it has transformed by body. I absolutely love going. It’s an act of self-care and I feel stronger than I did in my 20s. It took me many years to understand the importance of self-care but carving out an hour a few times a week to care for my body and mind has made me more resilient to life’s ups and downs. I’m thankful for God’s love – My boys had a Sunday school teacher who used to stop each child before they left her room and whisper in their ear “Nothing can separate you from the love of God”. It was such a simple act but my boys and I still remind each other of this when we pray. To know God loves me no matter what feels like I can go home at the end of the day and know that despite my failures or successes, I am loved and I’m enough. What are you thankful for? This list is just scratching the surface for me but I’d love for each of you to take a few minutes to reflect on 2018 and give yourself a pat on the back for making it one more year. The gift of life is the greatest blessing. Thank you for being a great friend and client and I wish you the very best in 2019! What is mailbox money? Well, simply put it means - passive income; money that I collect while sipping sweet tea on my front porch. Sure, it requires an initial investment, but with rental income, you collect a check monthly without having to actively work at a job to earn (i.e. active income). Let’s use my house on Canterbury Street in East Austin as an example. I paid $175,000 for it in 2011 and the mortgage is around $1500 with taxes and insurance. I rent it for $2800. This is $1300 in “mailbox money” per month and last I checked the house is worth $700,000. Can you tell me a better investment? I’m getting paid each month and I have a serious chunk of equity. The property also has enough room to build a garage apartment in the rear. This will allow me to invest another $150,000 to build a secondary unit and collect another $2000-$2100 per month in additional cash flow. I give you this example to show ways to maximize the value of your property. Can you add a second unit? Can you convert a portion of your house to a rental? Does buying a duplex or a multi-family property make sense? If the cash flow exceeds the monthly expenses you have instant “mailbox money”. For so many people, investing in real estate is a scary venture; the initial time and money, the risk, the unknown. But I hope I can encourage you to think differently. Ask yourself, ‘what is it going to cost you to NOT invest real estate? Creating a flow of passive income may be what allows you to move on from a job you aren’t happy in, retire early, or simply stop stressing about the value of your 401K. Life is meant to be lived; whether it’s traveling the world or working less so you can spend more time with your family. Today’s investment, is tomorrow’s opportunity. A friend of mine used to tell me, “Leverage yourself while you are young”. He encouraged me to stretch myself early in life so that I can enjoy the rewards later in life. If you have ever considered this type of investment, it may seem like too much work or too much money up front. Ask yourself, “what am I willing to sacrifice?” We live in a culture that encourages us to keep up with the Joneses; new cars, new TVs, new clothes, new technology. Sit down and analyze your monthly expenses and your monthly investments. Is there room to spend less and invest more? Real wealth is defined by the length of time you can live off your assets if you lost your job tomorrow. Life’s too short. Do something now, even if it’s buying a cheap property on outskirts of town. I hear so many people saying there are no more good deals. It’s just not true. You don’t have to buy in central Austin. People always need a clean place to live and it’s fun to provide others with a home. Find something solid in an area that makes sense and watch what happens. Invest in your future now and when the time comes, you can join me on the front porch, share some iced tea, and wait for the mail (wo)man to arrive! - Inside my current project, my garage apartment right behind my home. The views of the city will be spectacular. Can’t wait to show you the finished product! See the progress and follow along as it’s being built in my Instagram highlights. I met Dagmar in 2009 when I called her about a beautiful historic house at 1012 E. 8th street that she was selling FSBO. I was not in a place to buy another home for myself but I had clients in mind. I introduced her to my clients and they wanted the house immediately. She offered to “carry the note”. My clients jumped at the opportunity to use her financing and save their cash for the remodel. This was the first time I had seen this done and I wanted to know more. Dagmar and I stayed in touch through the process and became friends. I love learning from my elders and she had so much wisdom to share. The day came when I found an opportunity I could not pass up. I was not in a place to obtain conventional financing and the house was so special I could not stop thinking about it. It was a 1907 Victorian style farmhouse walking distance to Rainey Street. The house was empty and the grass was tall. I called the owner and he was tired of taking care of his parents’ house. They had long since passed and he was ready to sell. He agreed to sell it to me for $175,000. I could not contain my excitement, this was the most beautiful home I had ever laid eyes on. I called Dagmar and asked her if she would be willing to carry the note. She agreed to a 12 month term, interest only which allowed me to remodel the house on my own dime and then have enough equity afterwards to refinance into my name. I did just that and paid her off early. I am forever grateful to Dagmar for trusting me and sharing her wealth with a young determined mother of two small children. We have done many deals together over the years and I have learned so much from having her as a friend and mentor. When I count my blessings, I count her twice. I asked Dagmar to share her story and some bits of wisdom for my blog, and I could not be more impressed by these simple yet impactful rules to live by . . . Mine is a fairly compelling Life Story: I was born in Germany just before the start of WWII into an upper middle class family. My mother was a sweet and talented wife and mother. My father was an engineer and a rising star in business. By the time I was in first grade this came to a screeching halt. My father was drafted and went to the Russian front. My mother and my aunt fled from the advancing Russian army with myself and my baby brother and with what they could carry, not much. I lived my entire childhood and adolescence as a displaced person in abject poverty. After many twists and turns I arrived in Austin. Today I am a retired bank officer and still managing my investments, predominantly in Austin real estate. That is due to hard work, considered risk taking, and a fair amount of good luck. 1. The Golden Rule – simply treat others as you would like to be treated. In every transaction conduct yourself in such a way that you could interact or do business with the same party again. 2. Live within your means – that means knowing the difference between spending and investing. An 85 inch TV may be great to watch your favorite program; it is not an investment. 3. Set Goals – Goals may be personal: to lose weight, to earn that degree, to buy that house. Goals require planning and preparing a budget. Be aware that this preparation in some cases may take a long time. 4. Consider the time horizon for your various activities. Try not to let short term advantage cause you long term detriment. 5. Pay yourself first – If you have set some financial goals you will need to accumulate funds. Waiting until the end of the month to transfer left over money from your checking to your savings or investment will not do the trick. Instead, make that transfer of a well-considered amount at the beginning of the month and let your money work for you. 7. Live and let live – Be proud of your achievements and be thankful for your opportunities. Set aside some of your bounty to help others who are less fortunate. It is thrilling to make money. It feels even better to give some of it away. I live in East Austin and have been buying in that area since 2003. As 78702 prices skyrocket, I have always kept a close eye on the the Montopolis neighborhood. If you take 7th street east and head south on the 183 overpass, Montopolis Blvd is the first exit. It’s literally a stones throw from downtown and some of the streets, Kemp Street for example, have stunning downtown views. The easy access to the airport and Riverside Drive also make the area desirable and ripe for appreciation. Prices are on the rise, and this is a buy/hold or a buy/develop area that won’t leave your investment disappointed. Location, Location, Location! This is a quiet neighborhood directly behind the South Central Market. Large yards, wide streets and classic ranch style homes. In my opinion, there is room for appreciation. You’ll see that homes have been renovated but rarely see them hit the market . . . proof that people are buying and staying. This is an older neighborhood ripe for a remodel and appreciation! The access to Mopac, 71, I35, 360, Lamar, and South Congress allow you to be anywhere in minutes. Gracywoods is a community located at West Braker Lane and North Lamar Boulevard with homes built in the 1950’s. This area has mature trees, great parks, trails and a community pool. You can get in the neighborhood under 300 and the proximity to the Arboretum and the Domain will only help increase the value of this little pocket. Western Oaks is an established subdivision located in Southwest Austin. The borders are William Cannon and Convict Hill, and Beckett and Brush Country Road. This neighborhood is best known for its wide streets, green belts, and neighborhood amenities. Much like Western Trails, this is an older neighborhood with well built brick homes and large lots. It is very difficult to find a house because they usually sell before they hit the market. Around the corner from the south Whole Foods and dozens of new shops and restaurants! I personally think anything surrounding Convict Hill will make a great investment. This north Austin gem located west of 183 off of Oak Knoll is full of mature trees, parks and well build brick homes from the 70s and 80s. The area has appreciated through the years but I feel like you still get great bang for your buck. The schools are zoned for Round Rock ISD, and Kathy Karaway is a sweet little elementary school tucked in the neighborhood. I discovered this neighborhood years ago and fell in love with the HUGE oaks, large lots and sprawling ranch style homes. Back in the day it felt too far out to be a great investment, but now with the Domain development still spreading like wildfire this secret pocket has a lot of upside. Eubank Acres is between I-35 and North Lamar Blvd just East of Braker Lane. If you are looking to get out of Austin, I think Lockhart is a great spot to buy/invest. Prices remain low but the community is growing and there is a real need for rentals in the area. Besides barbecue, you have Chaparral Coffee, Loop n Lil’s pizza, Spellerberg Gallery and many great vintage shops on the square. Venture out of Austin one weekend and go check it out! 1. Add original art: Hanging an original painting can make your space feel custom and unique. It’s a way to make your space feel special and collected. However, a commissioned painting can be quite the splurge. But did you know many artists paint a small proof for you to approve before they paint the actual commissioned piece? What do the artists do with all those beautiful original proof paintings? Some of them sell the proofs for a very reasonable price. My favorite artist and talented friend, Rylie Caldwell Art, sells her beautiful 5x7” painted proofs for $35 at her art shows. Jackpot! Etsy also has great original paintings by talented up-and-coming artists at a great price. Below is an example of how original art adds a collected feel. 2. Mix it up, textures: Adding different types of textures provides interest and comfort. Below, I love how the walls are glossy, the sofa is velvet, one chair has textured/patterned fabric, while the other chair is leather. Each surface and material are different, giving a layered look not found in a traditional furniture/home store. 5. Fake it gold: Can’t afford to buy a new piece to incorporate your love of gold? Trust me—gold spray paint is your friend. 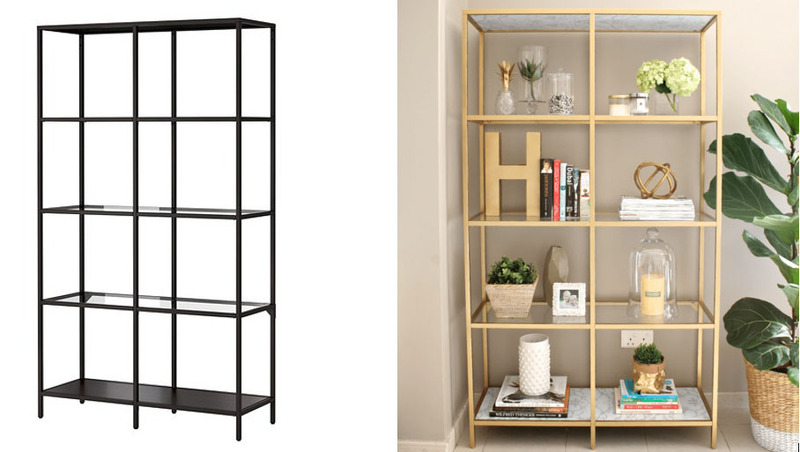 House of Hawkes did a DIY gold Ikea shelf, and it more than satisfies the need for gold! 6. Add flowers and greenery: You don’t have to spend a ton on fancy bouquets. Go to your local Trader Joe’s where flowers are as low as $3. Or, put a single fern frond in a vase for a unique way to bring the outside in. 7. Add candles to your routine: I love the way my favorite store smells—it’s relaxing and calming to me. Since smells are associated with emotions, I buy my favorite store’s signature candle for several rooms of my house. Burning candles day or night is a small indulgence that makes my home feel (and smell) more luxurious. 8. Upgrade the hardware you touch the most: How many times a day do you open your pantry door? Probably a lot (especially if you have a toddler!). 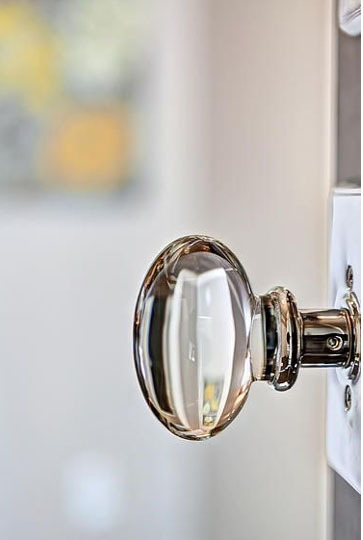 You’d be surprised how a slight upgrade to the pantry door knob might add luxury to your day-to-day. 9. Line your drawers with paper: Some luxuries aren’t for anyone else but yourself. Lining your drawers is a simple and inexpensive way to do something for you. I tend to line my drawers with wrapping paper from World Market or Paper Source. 10. Buy a rug large enough for your space: Most people buy rugs too small for their space…probably because rugs can be expensive. Your room will look better with a less expensive rug that’s the right size, vs. a more expensive wool rug in the smaller size. In the two pictures below, the larger rug grounds the room and makes the room more substantial and inclusive. For a less expensive rug to hold you over until you buy the rug of your dreams, I think Urban Outfitters, Lulu and Georgia, and Rugs USA have good options in different price points (filter by your price point!). 2. It doesn’t have to be all or nothing: This is huge. If you’re starting a business, or coming up with a new venture and you feel like you have to quit your day job right away, this isn’t the case. Work smarter, not harder. Find out the things that absolutely need to be done and focus on those instead of getting too far ahead of yourself. I find that if you make a to-do list, start with 6 tasks. Always list the things you least want to do first and work from there. Working through and finishing the first few tasks increases your satisfaction more than happy hour! Procrastination can make you feel like world is against you. Grab a journal and a calendar. Never underestimate the power of writing down your tasks/thoughts. Hang that bad boy up on your fridge so you can actually see your daily goals. It’s amazing how things will shift! 3. If you do what you love you have a better chance at success: It’s hard for anyone to succeed at a job or career when their heart isn’t in it.. I look at it like a relationship. If you are with someone you aren’t fully into do you think you’re going to be a good partner? Not even close.. Do what you love and nurture that something until the cows come home. And they will come! 4. Because who cares what people think: Everyone cares what others say.. At least a little bit. No matter how smart you are, how funny you are or how pretty you are.. You will always find that negative person who will try to steal your sunshine, but you know what? Say bye to the haters! Don’t let the fear of what others say or think say hold you back. You deserve to follow your dreams. 5. You only get one life: Whatever it is you have been wanting to do and are waiting to do, just do it. Life really is too short to keep waiting. You don’t want to look back one day and regret staying in a rut when you could be nurturing your dreams. I know it seems tough, and it probably will be .. But if you truly want to do something and have a passion for it stop waiting. Trust me, it will be worth it in the end. I find that when you take steps towards your dreams, the universe moves mountains by putting people in your path to help you succeed. What is it you want to do and are holding back on? Why are you holding back? Comment below and let me know. I hope this post gives you the jump start you needed to get going. You’ve got this! As the latest report from ABOR shows, the Austin-area real estate market remains strong as we enter into 2018. Historically, we see listings and home sales rise as we move towards the Springtime. This is good for homebuyers, but can sometimes mean sellers need to get a little more aggressive in preparing their homes for sale with more competition on the market. We have put together a list of our favorite tips to help you prepare your home for sale so that it stands out amongst other listings. 1. Improve your curb appeal by freshening up your landscape. Curb appeal is so important in making a good first impression. By adding in some fresh green plants and pops of color your yard can come alive. We also recommend weeding, having the lawn mowed and livening up any beds with fresh mulch. 2. Clear the clutter! This is true both inside and out. Sometimes sellers are so concerned with clutter inside that they forget that a clean exterior is just as important. Clear any items that are creating clutter or are not in use from porches and/or side yards. You would be amazed how a quickly de-cluttering can heighten the appeal of your home’s exterior. 3. Think ahead and make any necessary repairs. It is important for your home to be in tip-top shape when listing. Make an effort to repair any obvious defects or problems such as holes in walls, broken windows or a leaky roof. It is also important to take care of the more cosmetic issues like scuffs on the walls, dirty carpet and old, dingy paint. 4. Make the front porch fresh and inviting. You know what they say about a first impression. 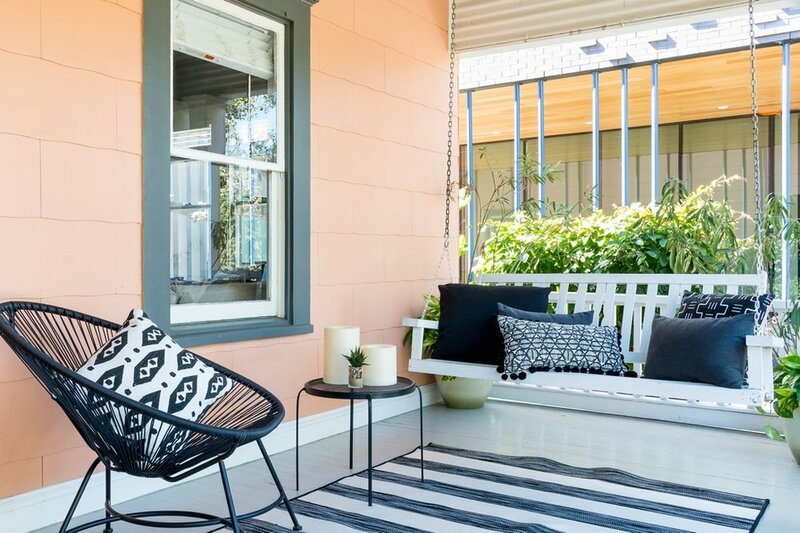 The front porch is most likely the first place a potential buyer is going to stop and really begin taking a look. A fresh coat of paint on the front door and surround, especially in a color that contrasts with the home, will make the front door stand out. Also, replace faded or outdated house numbers so buyers can see them from the curb. 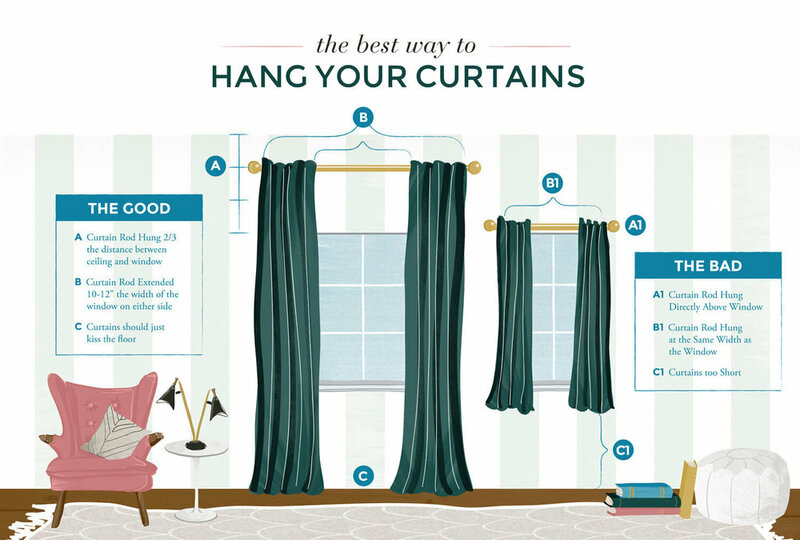 This is a simple way to also update the look of your home. Placing a new and clean welcome mat at the front door along with a few cute decorative items also helps to set a positive scene. 5. Remove interior clutter and depersonalize your home. We have a saying about listing your home that goes like this: the minute your home goes on the market it is no longer “your home”. We take this one very seriously. Buyers want to envision their belongings in your home; not your personal items and family photos. In some cases it may be necessary to rent a storage unit or pod to store all of your personal items, knick-knacks, photos and clutter. 6. Organize closets and drawers. Messy, unorganized spaces make them look smaller but also give the impression that the rest of the home hasn’t been cared for in a tidy way. These days most buyers are looking for optimal storage space. This small step can go along way in making your home feel desirable to buyers. 7. Clean, clean, clean! Take the time to thoroughly clean your home from top to bottom! We also recommend having tile and carpets steam cleaned to remove stains and undesirable odors. Prior to each showing be sure to clean up your clutter. It’s smart to have attractive storage bins on hand in high-use areas like your vanity and the kitchen to toss small items into before potential buyers come to see your home. 8. Create a neutral palette. Though you may love bright colors and mismatched pillows and décor, we know for sure that more neutral, well-coordinated spaces photograph and show much better. Paint your walls a neutral color that will appeal to a wide range of buyers. You can also swap out outdated bedding and small décor items such as pillows and lamps for items that are neutral and on-trend. This can add style to your home and make it appear to be a bit more updated. 9. Eliminate bad odors. Try your best to remove odor-causing sources from our home during the showing phase. Hide the litter box or place it in the garage if possible. Don’t cook highly aromatic food in your home the day of showings. You can also spray air neutralizer throughout your home, but DON’T go overboard! Choose a clean scent if you are going to take this step. Burning a nice and simple-smelling candle prior to showings will often do the trick. Buyers use all of their senses when previewing homes, so be sure to take this one seriously. 10. Bring in a few green plants or fresh flowers. You can really liven up a space by bringing in a fresh green plant or bouquet of flowers. Again, you don’t need to go overboard or spend a lot of money here, but rather choose 2-3 key areas to place these items. We recommend the kitchen, in the main bathroom and on the coffee table. We are always here to help you prepare your home for selling. Please reach out to us for a consult and ask about our complmentary home styling. 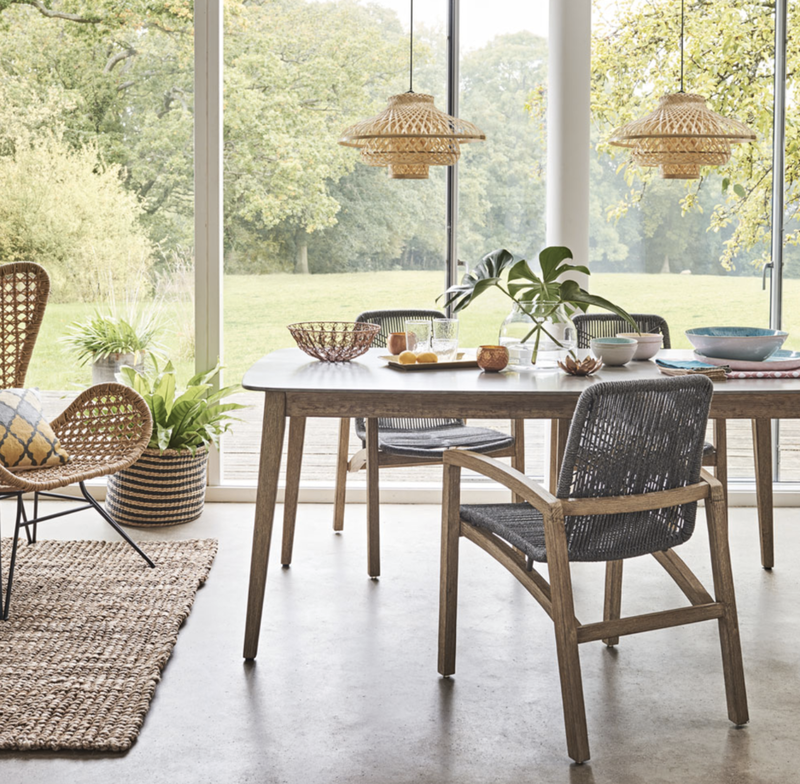 With a new year upon us, we are getting excited about what we will be seeing in the coming months as home trends for 2018 begin to emerge. We enjoy staying on top of current home trends so that we may advise our clients on keeping their homes current, ways to update their homes now in an effort to add value, and choosing the right finishes on new builds. We went straight to a few of our favorite sources including theeverygirl.com, refinery29.com, Elle Décor, Houzz and Pinterest to round up these 2018 home trends. As always, please reach out to any of our Stone & Acre real estate agents to talk in further detail home home trends, how we can help you ready your home for sale or just add some timely updates. The Little House Has a Home! We are so excited to share that our labor of love, The Little House, has found a home! When we partnered with Reclaimed Space on this beloved project, we suspected it would sell fast. Because the Reclaimed Space builds such an incredibly unique and sustainable product combined with the fact that our team has such a vast knowledge of home trends, The Little House turned out to be a very desirable space and sought after product! It's new owners not only purchased one structure but ended up ordering a second structure to be placed in close proximity. At the end of December, Reclaimed Space shipped the Little House and the additional structure coined "The Big Little House" due to its larger size to the new owner's ranch on the Pedernales River. The ranch is a gorgeous piece of land that will now provide respite, a family gathering place and we know lots of fun to it's Central Austin dwelling owners. We were also thrilled to partner with West Elm Austin on the project for interior furniture and decor. They came in and transformed the beautiful, clean palette into a very welcoming and finished space. Everyone at our project reveal loved the the way it all turned out. Scroll for a close-up look at our complete Little House. A very special thanks to all who partnered with us and helped make this incredible dream come true including Reclaimed Space, West Elm Austin, Clay Imports, Ferguson Showrooms, Daikin, East Side Environmental Air, RAM Windows, Roosters Paint Center, Empire Countertops, Elite Turf Care Group, and Schroeder Austin. 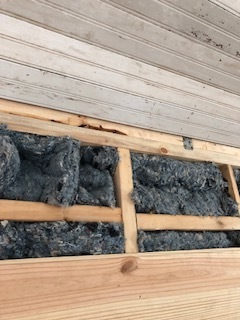 Click here to read more about where Reclaimed Space procured the interesting and soulful building materials that make up The Little House. The Little House continues to come right along as we have moved into the interior finish-out phase. 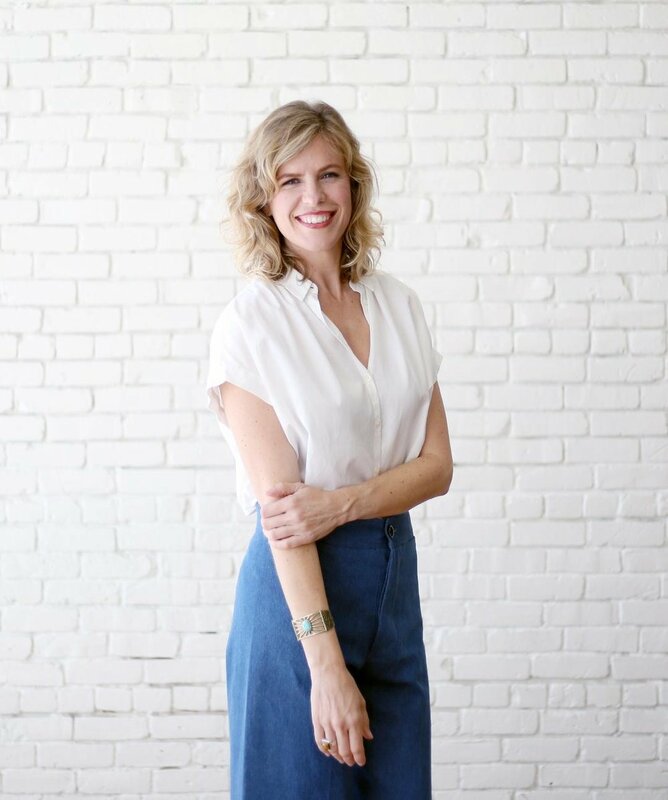 We are thrilled to announce our interior decor partner, West Elm Austin! Stay tuned in the coming weeks to see how they fill The Little House with furniture pieces and decor to bring a special energy and style to the space! Over the last couple weeks, Reclaimed Space has been hard at work adding beautiful reclaimed materials to both the exterior and the interior. Board and batten reclaimed from an 1830's whiskey refinery in Rumsey, Kentucky went up on the outside and was painted a traditional bright white. On the interior, gorgeous reclaimed wood floors were installed. Each piece of the floor was hand-selected from various Texas farmhouses and a Texas Panhandle church. We couldn't be more excited about how they turned out. Beautiful bead board reclaimed from those same Texas farmhouses and Texas Panhandle church now covers the ceilings. The variation of the wood is perfect, and adds such a unique look to the space. Check back for more progress on The Little House over the coming weeks! We are planning an amazing project reveal party and pop-up for Saturday, November 18. More details to come, but you won't want to miss it! A very special thanks to all of our partners including West Elm Austin, Clay Imports, Tops Kitchen and Baths, Ferguson, Daikin, East Side Environmental Air, RAM Windows, Roosters Paint Center, Schroeder Austin, Moore Supply & Empire Countertops! 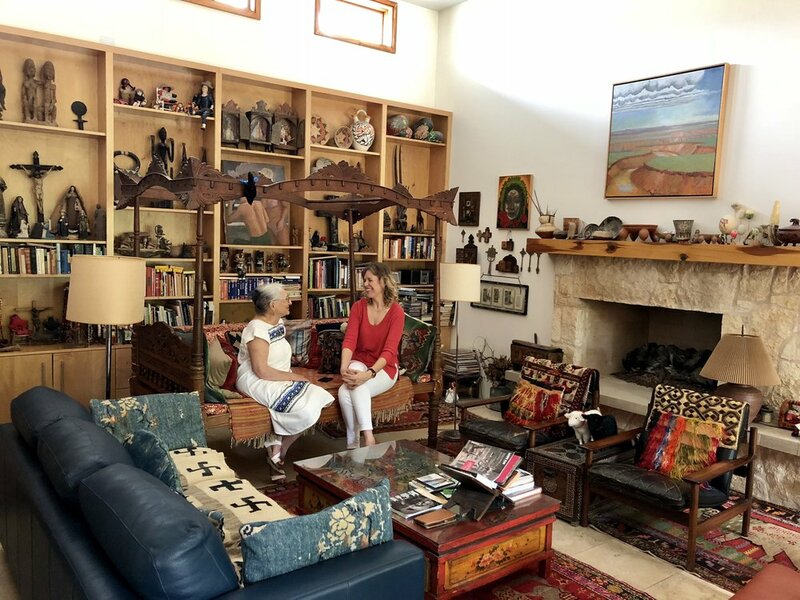 Subscribe to our newsletter, The Stone & Acre, to receive monthly market reports, tips on buying and selling in the Austin market, and our exclusive listings!